Matching bushy caveman beard perfect to bring out the neanderthal in you. Caveman Costume and Club sold separately. 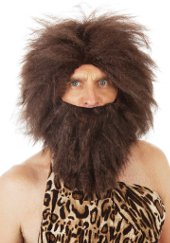 Perfect to portray those who were around at the time of The Croods, or The Clan of the Cave Bear, this wig and beard set will bring primitive charm and authenticity to your neanderthal outfit or caveman costume.